Dewitt has not only made the news in the US, but check out this paper from Qatar. If you haven’t seen it yet, check out my blog over at the Southeast Missourian. I was at Memphis on Friday night. Here are my scouting reports on the Redbirds in the lineup. Blake Dewitt made his big league debut in impressive fashion on Monday. The rookie third baseman got a hit in his first at bat, a single to left/center. He would come around to score on a hit by Rafeal Furcal. Blake would fly out to the warning track in his second at bat and would walk twice in his final two plate appearances. Not a bad day indeed. There is still plenty of youth to either blend — or clash — with veterans like Kent. 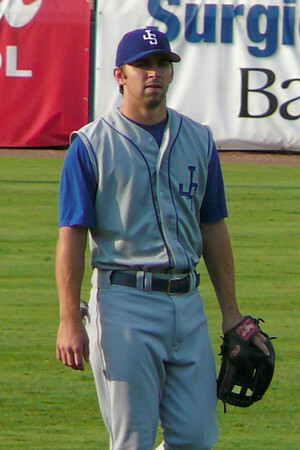 For example, there’s Blake DeWitt, whose three-week meteoric rise from Minor League camp to Opening Day third baseman included starting a key second-inning double play and singling in his first Major League at-bat. DeWitt’s unusually calm exterior finally cracked, but not until the final play when Takashi Saito threw out Ray Durham on a comebacker. DeWitt, however, credited some of his cool to the advice of Kent, a teammate perceived by some as a troublemaker last year for sounding off about his frustration with the approach of some young players. But DeWitt said Kent made a difference for him Monday. The Cardinals were rained out after jumping on the Rockies early. Yes, it is was only three innings but it was nice to see the team produce some runs against a talented left hander. Mizzou dropped to Number 4 in this week’s Baseball America Top 25. J.R. Bizzell is hitting .317 in the leadoff spot for the Number 23 ranked Rhodes College Lynx. Less than 24 hours away from opening day for the Cardinals. Should be interesting to say the least. It is good to see a reported nice guy like Rico Washington finally get his shot. “Injuries to third basemen Nomar Garciaparra, Andy LaRoche and Tony Abreu have left the club uncomfortable with rookie Blake DeWitt the likely starter when the season opens on Monday against the Giants. In addition, Jeff Kent’s durability is questionable coming off a right hamstring injury. Colletti said a trade in the next 24 hours was doubtful, but he wanted the wiggle room if one happened or if a third baseman good enough to start for the Dodgers was released. Philadelphia’s Wes Helms (owed $2.9 million) is the most likely candidate. If neither happens by Monday, Colletti said the club would scout available players over the next two weeks while watching how the 22-year-old DeWitt fares against Major League pitching. DeWitt has never played higher than Double-A. I guess we will see but I say the odds are now stacked in Blake’s favor. If you haven’t seen it yet, get over to MLB.com archive to watch Dewitt hit a 2-run shot off of Jonathan Papelbon on Saturday night. In front of 115,000 fans no less. Mizzou dropped its first series of the season to Texas Tech. Aaron Crow was his usual dominating self. Man it would be nice if by some act of God he dropped to the Cardinals at Number 13. Yeah, it would take an act of God. Yes, my posts have been sporadic at best. I was hoping that the Rockies would put up more of a fight but I didn’t think they had a chance going into Fenway Park in October. I was really surprised Aaron Cook looked as good as he did after such a long layoff. The Rockies will surely be back, but it will be tough in the NL West. Speaking of the NL West, it looks like the Dodgers are going to have a new boss. Maybe. Anyone in Cardinal Nation still want ARod? If you want a guy with big stats, possibly. If you want a winner, I am not so sure. I don’t see the Red Sox letting Lowell get away nor do I see Theo messing with the chemistry of that team. And that team is loaded with good young talent with more help from the Minors on the way. No word yet on Antonetti but I have to believe he is the guy. Blake Dewitt is hitting .375 in the Arizona Fall League which would rank fourth in the AFL if he had more at bats. It was really good to see Joe Mather get named to the 40 man roster. He has worked hard and deserves it. I was disappointed that Renteria went to the Tigers. I really hope we are not stuck with Eckstein. Keep checking out the Birdhouse for my most recent articles. According to Brian Walton, Mike Maroth has been released by the St. Louis Cardinals. After a strong start vs. the Mets in his Cardinal’ debut, Maroth really stunk it up. I really think he was hurt, but now it will be someone else’s problem. Jarrett Hoffpauir was the only Cardinal in action in the Arizona Fall league. Hoff had a hit a walk, and 2 runs scored. Project Prospect has its Top 75 list out and the Cardinals made a big splash. Colby was rated as the number 2 prospect in all of baseball. Left handed pitcher Jaime Garcia was rated number 64. Bryan Anderson was rated number 66 (of note he was the number 3 rated catcher on the list). Also in the desert, Blake Dewitt was in the lineup at firstbase. Blake had 3 hits including a double. Check out Bryan Anderson’s journal at the Team USA website. BOOKMARK THIS SITE AND CHECK OUT THE BIRDHOUSE! With limited at bats so far during the Arizona Fall League, Jarrett Hoffpauir has made the most of his opportunities and is putting himself in the mix for a role on the 2007 Cardinals. In Thursday’s action, the second baseman was 2 for 5 with two runs batted in and a stolen base. The 24 year old is now hitting .333/.429/.333 with four runs batted in six games and 18 official at bats. Monday’s AFL action saw the return of Mitchell Boggs to the bump. Having not allowed an earned run in his first two starts, Boggs proved he is human giving up two runs on two hits and two walks in three innings of work. In three starts, Boggs, who had pitched six scoreless going into this game, has an ERA of 2.00 in nine innings of work. Jason Motte got in a perfect inning of work, lowering his ERA to 3.60. Mark Hamilton had a good game with a hit and two walks. The first baseman is hitting .188 in the Arizona sun. And, as I first reported over at the Birdhouse, Amaury Cazani Marti has been named as Joe Mather’s replacement for Mesa, but has yet to make an appearance. Blake Dewitt has made the most of his opportunities in Arizona. With another hit on Tuesday, Blake is now hitting .316/.364/.421 with only one strikeout in 19 at bats. With Tony’s track record of choosing veterans over youngsters, some of his comments from his press conference were quite interesting: “To set the record straight, if I had to choose one, I’d take the young team,” La Russa said. “I’d rather have a group of young guys with true talent than I would (older) guys who are on the (declining) side of their careers.” Huh? Did he forget that he played Miguel Cairo over Brian Barden at the end of the season and that Cairo took playing time away from Brendan Ryan? It feels like I have been neglecting you guys a little, but I have been working quite a bit. Check out my interview with Blake Hawksworth over at the Birdhouse. There no AFL games on the schedule for today. Check out my latest recap here. It no secret that Cardinals need pitching. I think with the Free Agent market being so thin I would take a flyer on Livan Hernandez. The guy is durable and keeps you in the game. With the mediocre season he had in 07, he might be halfway affordable. It seems as each day passes, it is more and more likely that TLR is returning. One reason, there doesn’t appear to be a match for him at this time. Dusty is coming back to the NL Central. Dusty will be the new man at the top for the Reds. Imagine, back to back series with the Reds and the Cubs. TLR will be wound tighter than an eight day clock. Word out of New York is that George is handing over the reins to his sons. Say what you want to about the Boss, he did what we wish our owners would do, put all his resources into the team. Right or wrong, he tried to win no matter the cost. Baseball is definitely losing a pioneer. I wonder how this affects Torre and possibly, TLR? This post season has been quite exciting. If you like player development, how can you not love the Rockies/Diamondback series? Blake Dewitt is hitting .375 and has scored one run. Kaylee on Spring Training Surprises?